Haraprasanna Sau has been doing odd jobs since he was 19. He moved to Bengaluru from Kolkata in 2004 dreaming of a better life. It is only the last few years though that have propelled him from living hand-to-mouth to being able to afford what he once thought were luxuries – not just being able to pay for schooling for his children but also availing a pick-and-drop van service for them. Sau, a vendor with online home service marketplace Housejoy (and in the picture above), makes a surplus of Rs 100,000 a month by providing on-demand residential cleaning services. “Financially, the quality of life has improved,” he says, different from about five years ago when it was “kabhi khushi kabhi gham” (sometimes happy, sometimes sad). Still, the nationalised bank that he had an account with for decades held a dim view of Sau. When he applied for a personal loan last year, he realized that the lender had more than one way of rejecting you. A teller told him “it was process” that he would have to wait for months to get a loan of Rs 2 lakh. Sau, who needed the money to buy two-wheelers for his team, then heard about Housejoy assisting vendors in getting loans. He was pleasantly surprised when he received the loan from digital lending platform Shubh Loans in less than a week. What he didn’t know was that the speed of the loan’s approval was a result of his good professional behaviour or, more accurately, a “trust score” that he had aced. This trust score managed and monitored by Bengaluru-based startup Betterplace Safety Solutions is a constant evaluation of a blue-collar worker’s personal, professional and social conduct. 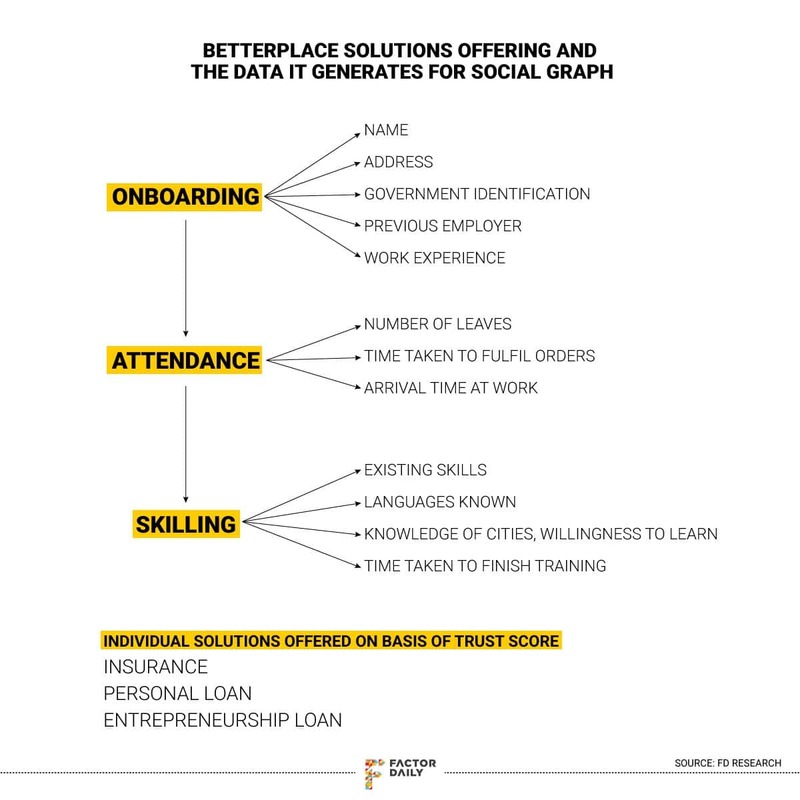 Pitched as a “lifecycle management solution” for blue-collar workers, Betterplace attempts to chart the social graph of India’s informal workforce — some 415 million workers who don’t get benefits such as provident fund, insurance or retirement support. Like Sau, the company monitors data of 4.5 million blue-collar workers in India. Right from onboarding and background verification, which is essentially the most critical cog of building a blue-collar workforce, up to offering them financial services such as insurance and loans, Betterplace is using data generated on employees as a tool to manage the largely unfragmented blue collar market in India for employers such as G4S, JLL, Cafe Coffee Day, Flipkart, Swiggy, Quikr, HSBC, Accenture, TCS, among others. Internationally, peers such as Checkr of San Francisco, which raised $100 million last year, conducts one million background checks a month, while in India others such as Mumbai’s IDfy do the same. 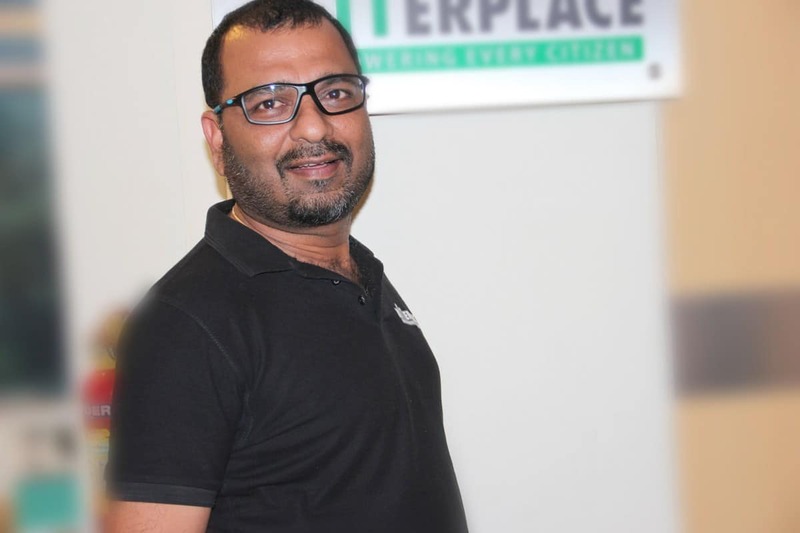 What makes Betterplace, backed by funders 3one4 Capital, Unitus Ventures, VH Capital and former Googler Lalitesh Katragadda, different is its scale and a deep learning algorithm powering it. Experts commend Betterplace’s rating systems not just for the support they provide workers. “ Better and faster verification processes such as these also help on-demand players like Swiggy or Uber ramp up faster, creating more jobs in the long run,” says Sajith Pai, a media executive who writes on startup topics such as the Next Billion Users on internet platforms. Data is tracked at every step of Betterplace’s lifecycle management solution. Through its offering of onboarding, attendance management, skill management and individual services, the tech stack of Betterplace keeps receiving data on employee behaviour that goes to build their ratings. Pravin Agarwala, CEO of Betterplace, says that trust score of employees is based on at least 200 parameters across three major areas: personal, professional and social. Some of these parameters include family structure, education, salary history, salary hikes over a period of time, the employee’s willingness to learn new things, how quickly he or she acquires new skills, social network, financial worth, work experience, and how many jobs they have switched. An attendance solution, which uses geofencing-based facial recognition attendance, helps rate employees on punctuality. A skilling module grades employees on factors like initiative and willingness to learn new skills, thereby prepping them for new job roles and promotions. It also helps in productivity enhancement, job satisfaction and retention of employees, factors that matter for any industry but are often neglected in case of blue collar workers. 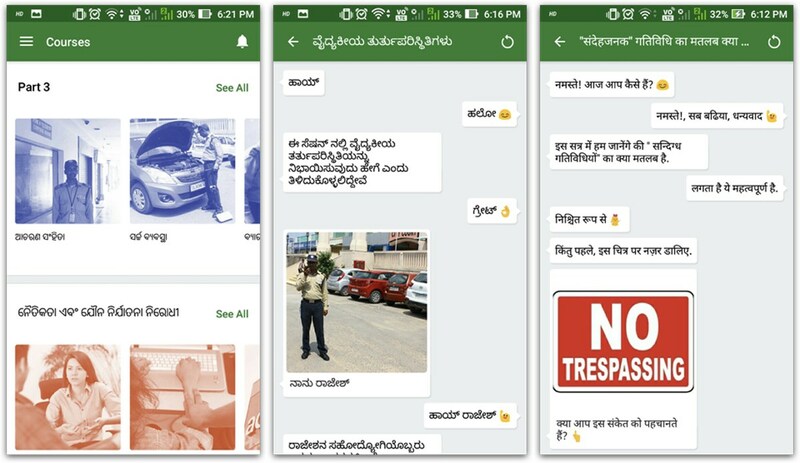 Chatbots in vernacular languages helps in the process. A large IT company that Agarwala doesn’t name opted for a vernacular skilling platform for its fleet of 1,000 security guards, he says. 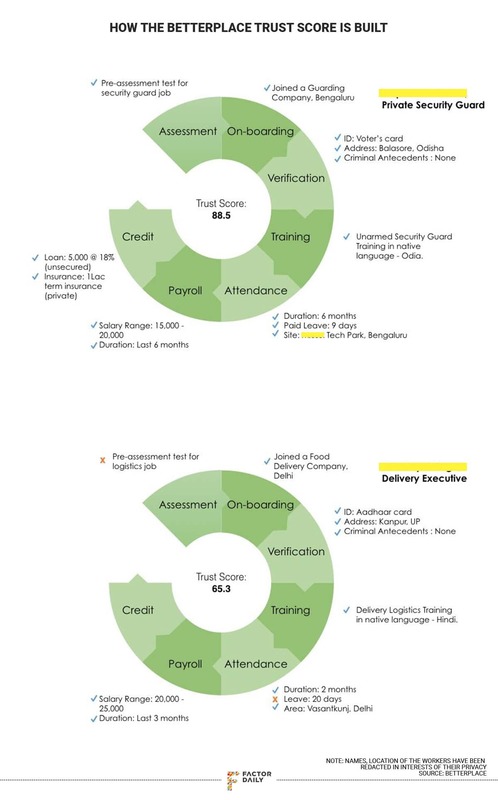 The learning and assessment platform was able to identify employees who finished training on time and were graded higher in assessment. They were later considered for bonuses and promotion, thus increasing the retention level and productivity of employees. The deep learning platform that forms the backbone of the Betterplace offering receives data at every stage of the lifecycle management of a blue collar worker. For example, during background verification, fake ID proofs and untraceable addresses reduce the trust factor of an employee. These factors are critical when it comes to hiring for roles of security guards to housekeeping staff at educational institutes. The process also weeds out fake skills or unskilled hires which in case of non-teaching staff in schools are as high as 80%, according to Betterplace records. The company has partnered with a not-for-profit organisation Early Childhood Association to verify records of around 2.5 lakh kindergarten staff. Agarwala says that during a recent verification of screening of 1,000 employees, the data didn’t add up for some. On further physical verification, eight were spotted with criminal records not accounted for earlier. The Betterplace deep learning algorithm uses direct and derived data of employees. Direct data is factual information like birth date, address, driving licence number, among others; derived data is based on factors such as integrity, trust and punctuality. — whether ID records match, their addresses are correct, they have good referrals, have not lied about experience or skill etc. Data from employers such as ratings from customers and previous employers’ feedback goes to building the trust score. Punctuality is a continuous stream of data tracked by Betterplace’s attendance solution. Employees who consistently come to work, reach the destination of service, and deliver an item on time are highly rated. The onboarding platform also looks at skills to verify the skills of an employee (e.g. : can ride a two-wheeler) and suggest required skills for a new role (e.g. : supervise a fleet of security guards). The algorithm, according to Agarwala, also gets data on the learning pattern of an employee, the time taken to finish a course, and existing skills to suggest new training courses. It makes suggestions on what formats and what languages to train a worker batches in. Such sets of direct and derived data coupled with a set of business rules help the algorithm calculate scores for employees. The rules can be as varied as, say, an upper limit of Rs 15000-Rs 20,000 for an employee in Bengaluru or that an employee who has changed three jobs in last six months will not be eligible for a credit. The database can throw up interesting opportunities, says Agarwala. For example, a data-based observation that 80% cooks in Bengaluru come from a certain pin code of Orissa can help identify business models around such information. The last few years have seen a sharp growth in the income of blue-collar workers making them customers for small loans and insurance. But, given that they have never been a part of the formal economy so far, they don’t have credit scores that help financial institutions assess their credit-worthiness and repayment capacity. This is where Betterplace’s trust score comes in handy. Using it, Betterplace has developed a credit score even for first-time borrowers and has been able to facilitate 500 loans through NBFCs, banks and the government’s Mudra loan scheme. For short loans with a typical tenor of between 15 and 45 days, 99% of them are paid on time, says Agarwala. The Betterplace CEO says that in many cases, the platform helps identify candidates with short-duration loan needs: as in the case of delivery boys, who require loans to buy a bike. Generally, the loan, which covers a downpayment of between Rs 10,000 and Rs 15,000 on the bike purchase, is paid back in six months. Timely payment of instalments adds to the credit score and it, like the trust score, is revised continuously based on employee behaviour. The Economic Survey 2018 pegged India’s informal sector to be employing over 90% of our 460 million-odd workforce. One key area of this informal – also called unorganised – workforce that has seen explosive growth in Indian cities has been so-called gig economy workers: the Ola or Uber driver, the plumber, electrician or mechanic on platforms such as UrbanClap or Housejoy, the delivery agents of Swiggy, Zomato or Dunzo, and the ubiquitous riders who ferry purchases on Amazon or Flipkart to their destinations. According to startup research platform Tracxn, over 270 startups catering to home services have been set up in India between 2012 to 2017, including horizontal firms that have numerous services categories and category-specific aggregators providing specific services such as laundry, home cleaning, plumbing, wedding planning, photography and fitness instruction. With all these services available at the tap of an app on a smartphone, the impact of these companies has been huge on the lives of blue-collar workers. Like Sau, it is common to hear stories of incomes rising manifold as these workers get more and more jobs to service. In addition, the better-rated ones get more work steered their way. But, what about the privacy of the blue collar worker? Agarwala says that data collected on behalf of employees is never without consent. “The employees are aware of their data being utilised,” he says. Indeed, that is something that Surendran flags, too. He uses the example of the TV series Black Mirror episode, Nosedive. “If an Uber driver’s rating affects his ability to get a loan for his child’s education, the system would lead to a new form of slavery. Data needs to be considered within a social framework that promotes empathy,” he says.